Grilled Pork Belly is a simple dish that you can make with pork. As the name of the dish suggest, pork belly is recommended for this recipe because it is perfect for grilling and it has a good enough fat content that keeps the meat moist and flavorful. I will not talk anything about being healthy today. I am assuming that we all know what is best for ourselves and that everything in moderation is acceptable. No matter how good this Grilled Pork Belly tastes, try to control yourself and eat in moderation – I know, it is easier said than done. Well, just pretend that you tried – okay? The good thing about this Grilled Pork Belly recipe is that it is still tasty even if marinated for only 1 hour. The key here (aside from the tasty marinade) is the way the meat is marinated. I think that sealing the meat and marinade in an air-tight bag helped the meat to get covered by the marinade completely which allowed quick absorption of flavors. The powdered spices also played a role in the process. 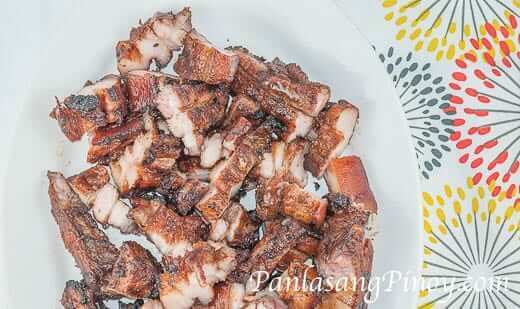 What do you eat Grilled Pork Belly or Inihaw na Liempo with, aside from rice? For me, I like it with atcharang papaya (pickled papaya), and sometimes with cucumber salad or Atcharang Labanos (pickled daikon). There are times wherein you will have leftovers. In this case, try to make sinuglaw out of them or even kilawing baboy (pork kilawin). Try this Grilled Pork Belly Recipe. Let me know what you think. In a large bowl, combine the soy sauce, lime juice, ground black pepper, garlic powder, and hot sauce. Mix well. Put the cleaned pork belly in a large resealable bag. You can slice the pork belly thinner so that it can quickly absorb the marinade. Pour the soy sauce mixture in the resealable bag. Let all the air out then seal. Let the pork belly marinate for at least 1 hour. You can place the bag in the refrigerator during the process. Heat-up the grill. Start to grill the marinated pork belly for 3 minutes per side. Baste the pork belly with the remaining marinade. Note: Do this process at least 3 times. This means that each side of the pork belly is grilled for a minimum of 9 minutes (3 minutes x 3 times). This will prevent the pork from getting burnt quickly. Make sure that you baste it every time you flip it over. Grill longer if the pork belly is not cooked enough. Remove the pork belly from the grill. Let cool. Slice into serving pieces. mga ilan po dapat kung calamansi ang gagamitin?